National Institute of Technology Silchar (Assam), Is Recruiting Eligible People To The Different Non Teaching Post. So Interested Can Apply For This Job Through Offline Mode, Within The Given Time Period. 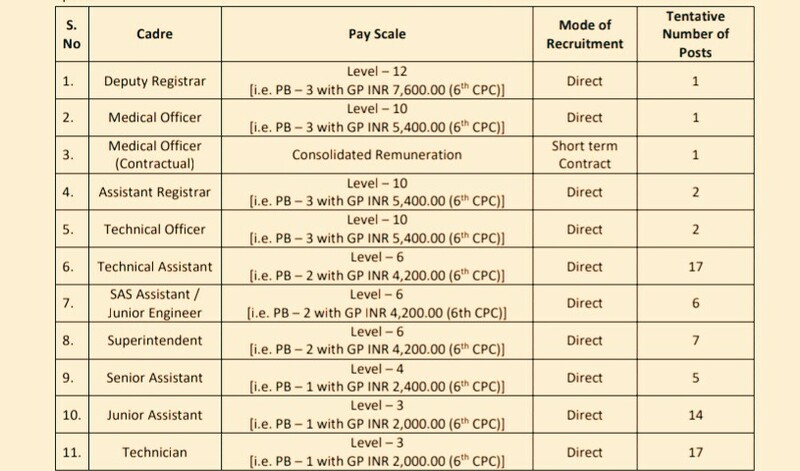 VARIOUS NON – TEACHING POSITIONS→73 Vacancies, Kindly Do Go Through The Image Below For Name Of The Post, Vacancies Distinction, Mode Of Recruitment And Pay Scale. (Credit- The Official Advertisement No. NITS/Estt/Advt/Non-Teaching/19). B. Eligible Criteria For Various Recruitment of Non-Teaching Positions at NIT Silchar. Age Limit →Kindly Check The Notification Below. Educational Qualifications →It's Mentioned In The Official Advertisement. Mode Of Examination/Selection Process →Based On NIT Silchar Selection Procedure. Offline Application/Examination Fee →Application fees of INR ₹1,000.00 for General/OBC candidates & INR ₹500.00 for SC/ST/PWD candidates be paid directly to State Bank of India A/C No. – 10521277057, IFSC Code – SBIN0007061 of Director, NIT Silchar. How To Apply →The prescribed format of the application form and the data sheet can be downloaded from NIT Silchar website (www.nits.ac.in). The soft copy of the application should include the following: i. the application form in pdf format ii. the data sheet in MS Excel in xls / xlsx format iii. the pdf version of the data sheet mentioned in 3. (ii) above iv. soft copy of the transaction slip for the fees deposited v. scan copy of postage receipt The soft copy of the application should be sent to the following email id: nfap.nits@gmail.com on or before 15 days from the date of publication of this advertisement in Employment News. The hard copy of the application should include the following: i. the duly filled in application form ii. all relevant documents (self-attested) iii. the hard copy of the data sheet iv. copy of transaction slip for the fees deposited The hard copy of the application should preferably be sent through speed post to “The Registrar, National Institute of Technology Silchar, P.O. Silchar - 788 010, Assam” on or before 15 days from the date of publication of this advertisement in Employment News up to 1700 hours. Persons employed in Government and Semi-Government organizations should submit the application through proper channel with advance copy directly to Registrar, National Institute of Technology Silchar, P.O. Silchar - 788 010, Assam. Those who fail to submit through proper channel should produce NOC at the time of interview. Applications received after the due date will not be considered and NIT Silchar will not be responsible for any postal delay. Candidates are encouraged to check the Institute website regularly for any update. Last Date For Online Application Form Submission →13th Of April, 2019. For More Info →The Official Website Of National Institute Of Technology. Now Apply For Various Non Teaching Job Vacancy In NIT Silchar Recruitment Notification 2019.